We recently started deploying an in-store digital merchandising network for COOPSCO cooperatives which operate retail locations in francophone schools and universities in the province of Quebec. Both the marketing arm of the headquarters for the cooperative and the independent retails have access to a web-based content management system to create and distribute content. On a weekly basis, HQ provides ad campaigns created in Flash to supplement their paper-based marketing. Managers at the retail level get notifications in the form of a digest about new content and they can pick and choose ads based on their goals or inventory. The retail locations can also create their own content based on templates to advertise products or communicate school events and charitable work. The COOPSCO network of cooperatives, which operates retail locations in the majority of Quebec’s francophone colleges and universities, has selected Mirada Media to develop and deploy an in-store and point-of-sale digital signage network in the institutions it serves. Mirada Media, a Montreal-based digital signage integrator and software developer, is pleased to announce its recent engagement with the Fédération québécoise des coopératives en milieu scolaire (FQCMS). Mirada has been selected to provide FQCMS with project and content management solutions for their in-store digital signage network at cooperatives in the educational sector, which operate under the COOPSCO banner. 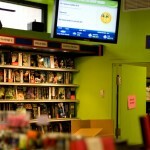 The COOPSCO network, which includes 60 cooperatives with over 100 outlets inside French-speaking high schools, colleges and universities in Quebec, will be rolling out LCD screens powered by a custom version of Mirada Media’s ChannelView player and content management system at participating school supply and book stores, clothing boutiques and cafeterias. While digital signage is used primarily to promote products and specials, a significant part of the content for the COOPSCO network is dedicated to informing members about the cooperatives’ events, initiatives and profit-sharing program. Although one of the goals of cooperatives is to work together for the mutual benefit of members, COOPSCO’s diverse locations and large footprint necessitated some content independence. 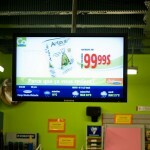 Mirada Media customized its ChannelView web-based content management system to allow the Fédération to post ads to a collective media bank, from which store managers are able to select individual media files to display in accordance with their unique marketing strategies. The ability to display certain ads may be restricted by the Fédération in order to accommodate time-sensitive promotional campaigns such as limited-time or seasonal offers. Managers are automatically notified of new content postings via system e-mails and are able to mark items as “read” to better manage their campaigns. Mirada Media will be including the functionality developed for COOPSCO into the next release of its flagship ChannelView digital signage software offering, slated for Fall 2010. 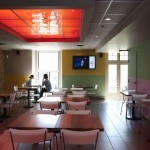 We recently did an install at a new Bánh mì quick-serve on St-Denis in downtown Montreal called Vua. For those who may not be familiar with the Bánh mì, it is a type of Vietnamese sub that combines thinly sliced pickled carrots and daikon, cucumbers, cilantro, chili peppers, pâté, mayonnaise and various meat fillings or tofu on a baguette made with both wheat and rice flour (yum, tasty). 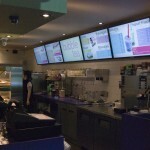 The installation includes a 5-screen digital menu board with some beautiful thin-bezel screens powered by a couple of our players controlled by our new MenuView content management system. MenuView is a Software-as-a-Service (SaaS) offering that allows our customers to manage menus and product items via a web browser. 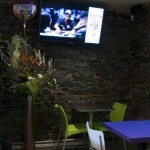 We also installed a couple other screens which capture digital cable and combine it in-restaurant promotional messages. 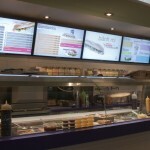 The press release describing Vua’s digital menu boards is below but we’ve got a couple pictures of the install here first for your enjoyment.